Though most include USB and FireWire ports, My testing focused on the eSATA ports since they provide the fastest transfer speed. In order to test an external eSATA enclosure on the MacBook Pro, you need the model with an ExpressCard slot and an eSATA ExpressCard. The graphs below show the transfer rates generated by the 2010 MacBook Pro 17" with the Sonnet Technology Tempo SATA Pro ExpressCard (except where noted). TWO PORTS ARE BETTER THAN ONE. The fastest dual drive RAID enclosure is Fusion F2 with a separate eSATA port for each drive -- in spite of the fact that it had 5K HDDs. SSDs BEAT HDDs IN THREE WAYS. The Solid State Drive (SSD) equipped "mini RAID" enclosures completed large sequential transfers faster than the Hard Disk Drive (HDD) equipped models. In fact, a RAID 1 (mirrored) box with SSDs ran faster than a RAID 0 (striped) box with HDDs. The gap is even bigger when you compare the small random transfers where the SSD reads 5 times faster and writes 3 times faster than the fastest HDD combo. Because of that limitation, it can be argued that going with two HDDs at a lower price and larger capacity makes more sense for most users of mini RAIDs. NOT ALL EXPRESSCARDS ARE CREATED EQUAL. As indicated, the above graphs show test results using the Sonnet Tech Tempo SATA Pro. If you only need one eSATA port on your ExpressCard, the OWC OWC Slim eSATA ExpressCard costs much less and installs flush with the edge of the 17" MacBook Pro. However, the Tempo Pro does reads 45% faster and writes 12% faster even when using HDDs. THE MINI RAIDS GO FASTER ON THE MAC PRO. The Mac Pro's PCIe SeriTek/2ME4-E eSATA adapter produces faster transfer speeds than the MacBook Pro's eSATA ExpressCard. For example, when we move the Elite-AL Pro Dual mini with SSDs from the MacBook Pro to the Mac Pro, it produced 25% faster reads and 88% faster writes. Why? Better bandwidth of the PCie bus. On a side note, we observed that the write speed of the 2010 MacBook Pro was slower than the write speed of the 2008 and 2009 MacBook Pros we tested with the same Sonnet Tempo Pro ExpressCard. That means something has changed in the 2010 ExpressCard slot -- and not for the good. WHO NEEDS AN AC ADAPTER? More and more enclosures are using the FireWire port as a power source while using the eSATA port for the data connection. That's saves you from having to lug around an AC adapter in your laptop bag. One hardware engineer is concerned that this may not be the best way to provide power to your drives -- especially if you upgrade your enclosure's drives to some super fast model that requires more startup wattage than the FireWire port can provide. It must be mentioned, as we showed in some recent articles, USB 3.0 is a close rival to eSATA in terms of speed. Though we don't have a USB3 mini RAID, we included the results for the LaCie 2Big dual drive 3.5" RAID box in the graphs above for perspective. S onnet Tech's Fusion F2 has two eSATA ports, one for each drive (which sit side by side). That explains why it is the fastest of the group doing large sustained transfers even though it uses dual 5K HDDs. Since it has two eSATA ports, it requires an ExpressCard or PCIe eSATA adapter with at least two ports. It does not have FireWire or USB ports. It is eSATA nor nothing. It was the first eSATA notebook RAID enclosure to use the FireWire port as a power source, though an optional AC adapter is also available. Tran s International's ProStor525L is a side-by-side design that's meant to sit under the MacBook Pro. Plus it is unique among the competing RAID enclosures in that it features two easy access bays that require no screws. You just pop the drives in and rock'n'roll. You can choose RAID 0 or RAID 1 with a small switch. You can select from eSATA, FireWire or USB ports. OWC Elite-AL Pro Dual mini comes with the choice of either HDDs or SSDs. Like the the Fusion F2, the drives sit side by side. However, it offers one eSATA ports shared by the two drives. You have the flexibility of either using the FireWire 800 port for a power source or as an alternative data connection. It also has a USB 2.0 port. NewerTech's Guardian MAXimus mini is also sold by OWC, but uses stacked form factor. It includes an LCD front panel with two buttons that enable you to set options like the RAID configuration (0 vs 1). It features FireWire and USB ports in addition to the eSATA port we used for our testing. iSto rage Pro's Pocket View (iT2PKTV) uses the stacked form factor and LCD option panel like the MAXimus mini but adds removable trays for the drives. 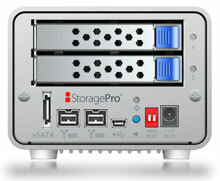 The eSATA port is accompanied by FireWire and USB. It includes a choice of AC power or FireWire bus power. The G-Tech G-RAID mini stacks the two HDDs but is more compact than the MAXimus mini or Pocket View. Ports include eSATA, FireWire, and USB. It includes a heatsink and cooling fan. One notable mini RAID not included in this round of testing is the LaCie Little Big Disk Quadra. It has eSATA, FireWire, and USB ports. Click on the links included in the article above.